Sovereign by C.J. Sansom has been languishing on my bookshelf for several years. It's book three in the author's Matthew Shardlake series, the last one of these I read being almost exactly three years ago. I don't know why I leave these books languishing like this, as this is a *good* series! Anyway, Sovereign is my book twenty four for Bev's Mount TBR challenge and my book eight for the My Kind of Mystery challenge. The year is 1541 and Henry VIII, his new wife Catherine Howard, and hundreds of court followers and officials have undertaken a Great Progress to Yorkshire. The idea is to reinforce Henry's position as king after a recent uprising in the area, humiliate various politicians who might have had a hand in it, and also possibly to have a meeting with King James V of Scotland. Lawyer, Matthew Shardlake, has been asked by Archbishop Cranmer to ride to York, to get there ahead of the procession and meet with another lawyer, Giles Wrenne, to sort out some petitions to present to the king. Reluctantly he also takes on a private mission for Cranmer, that of ensuring the safety of a prisoner, Sir Edward Broderick, presently locked up in the gaol in York. This man had been pivotal in the uprising and it's felt he has important information that he's witholding. Cranmer wants him brought to London for questioning but fears he might not make it. Shardlake's task is to keep him alive. Shardlake, accompanied by Jack Barak, a man who became his assistant during the events of Dark Fire, eventually arrives in York to find the city in turmoil as it prepares for the arrival of the king. He meets with Wrenne, the lawyer he's to work with and then sees the prisoner, Broderick. All seems well, if not exactly to Shardlake's liking. Then a glazier is found dead by Shardlake, early one morning, killed by being pushed off a ladder and pierced by glass. He lives long enough to whisper some cryptic words to Shardlake and thus it's he who is tasked with investigating the murder. The investigation brings danger, fueled by court intrigue. Nothing is quite what it seems and just to be party to certain bits of information can be a very real threat to your life. Shardlake and Barak become ever deeper embroiled in something they want no part of. But there is no choice and things will definitely get a lot worse before the mystery is solved. I said about Dark Fire that the crime element to this series is almost secondary to the historical element. 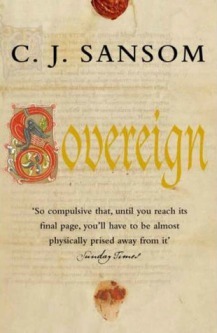 Sovereign is 650 pages long and a great deal of that is historical detail. Descriptions of York as it would have been, of the preparations for the arrival of The Progress, of The Progress itself, of the working conditions of just about everyone, of conditions in gaols and how prisoners were treated and yes... tortured. It is 'rivetting' and an awful lot of it made me glad that I live now rather than in the 1500s. It must have been scary stuff though that is from the perspective of the 21st. century of course... back then they knew nothing different. Life was cheap and cruelty commonplace. Shardlake was frequently referred to as a 'crookback' - an unthinkable thing to say about a disabled person these days - and insults were a daily occurrence he had no choice but to endure. But casual cruelty was not just inflicted on the disabled... the poor had no voice at all, women were at the complete mercy of husbands, fathers and so on, and anyone that displeased the king could expect no mercy. Henry VIII hardly appears in the story but nevertheless the book is all about him. His tyranical rule takes centre stage and again, it's rivetting. I learnt such a lot reading this. I had no idea there was such fear during his reign. It seems just about everyone was terrified of his displeasure. Shardlake unwittingly provokes it and the consequences are not pleasant. As well as all this there is a good mystery element of course. I kind of had that sussed, but naturally had no idea if was right: I was... but it didn't spoil my enjoyment. I say 'enjoyment', if I have one criticism the storyline is rather unendingly bleak. Not a lot happens that is fun, it's one disaster after another and maybe a bit of light relief would not have harmed. Regardless of that, the book was unputdownable and I really mustn't leave it so long next time before I read more about the world of Matthew Shardlake and his sidekick, Jack Barack. I also quite fancy some non-fiction about Henry and his six wives. I must see what's available but would welcome any recommendations. I enjoyed this series very much. Nope, never heard of the books or Patricia Finney so had a look around and decided I liked the sound of them very much. Annoyingly the library only has book 3 so I ordered a used copy of Firedrake's Eve from AM. Thanks for the rec! Henry VIII hardly appears in the story but nevertheless the book is all about him. I like the sound of that too. I don't have any book recs, but I remember using the film Anne of A Thousand Days when I taught the Tudors, and it was one of those films that I enjoyed more, the more often I watched it! Dissolution is the first book in the series. It's pretty good but not my favourite. Book 2, Dark Fire is fantastic and introduces Shardlake's new assistant, Jack Barak. They're brilliant together. Henry is a real menacing presence throughout Sovereign. Amazingly well written. Anne of a Thousand Days is wonderful, haven't seen it in years. Must keep an eye out in case it's shown on TV again. I picked up Henry: Virtuous Prince by David Starkey from the library today. It hasn't got brilliant reviews on Amazon but I'll give it a go and see what it's like. Good luck with the Starkey! Four reserves speaks volumes (no pun intended ;-)). I think I had a two or three year gap between Dissolution and Dark Fire and there was no problem at all. The books are very different. Thanks. I've watched his documentaries but not read his books. LOL. A Pros icon is never wasted.